Dehaka may not be the break out star of StarCraft II: Heart of the Swarm, but that doesn’t mean he wouldn’t be an amazing addition to the other HotS, Heroes of the Storm. Dehaka is a primal zerg pack leader from Zerus. He was among the last of the primal zerg pack leaders. When the Zerg Swarm returned to Zerus, Dehaka initially opted to simply observe the Swarm and Kerrigan. He witnessed the newcomers awaken Zurvan and the primal-infestation of Kerrigan. Dehaka perceived Kerrigan as the strongest Zerg and his pack welcomed the new power by allying with the Swarm. In the Heart of the Swarm campains we see that Dehaka is fixated on collecting essence, but not for the sake of power. Power, in Dehaka’s mind, is a trap, and one the other pack leaders fell into. For Dekaha, essence is survival. He had correctly predicted that the other pack leaders would refuse to similarly adapt to the arrival of Kerrigan and all of the other pack leaders were destroyed by by her, including Zurvan. Kerrigan confronted Dehaka afterwards, confirming that Dehaka had known that Zurvan would turn on her. He did not deny this—one zerg would grow strong, the other would fall. Dehaka remained with the Swarm. While the role of warrior seems like it would befit Dehaka, another commentor on TAY, Ilmyrn had this brilliant idea. 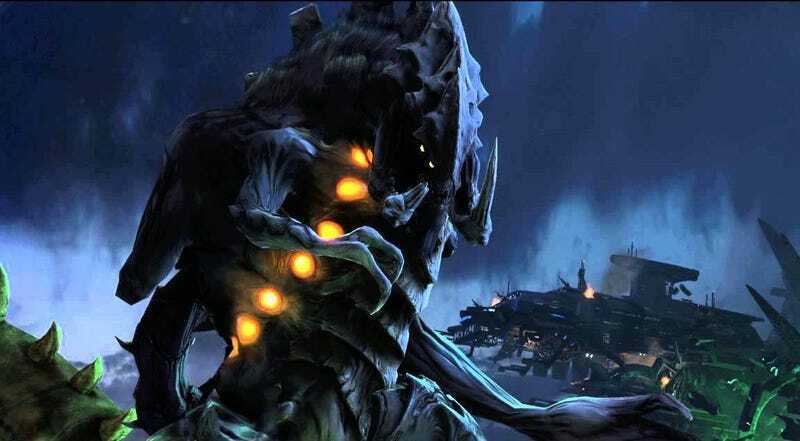 Dehaka, the Primal Zerg bruiser from heart of the Swarm, would be a great choice for a Zerg Warrior. he was obsessed with evolution, killing prey to absorb their genetic material to become better. That could be a fun hook to build on, as he absorbs the ‘essence’ of slain Heroes. Need more DPS? Hunt the enemy team’s Assassins. Want to be thicker? Target their own Warriors. The idea of him “stealing essence” on the battlefield to evolve whatever kind of build is needed is so fantastic. Heroes of the Storm already has quite a few character who have mechanics that are unlike any other characters. Obviously it would need to include weak points as well, such as taking assassin essence would lower your toughness/hp, but that is something that could be ironed out by the lovely people over at Blizzard. Dehaka also had heroic abilities in StarCraft that could make a good jumping off point for the developers to include him in Heroes of the Storm. Mend, which heals Dehaka for 150 hit points and nearby allies for 50 hit points. Afterward, all targets regenerate 50% of this health over 15 seconds. Spawn, which summons 2 spawns. The spawns have half of Dehaka’s hit points but deal full damage and last 30 seconds. On top of these, perhaps he could assimilate his ult ability from either a friend or foe in Nexus, there by choosing whatever powerful ability is needed to help sway the game in his teams favor. It would only be even better if he could battle on a StarCraft inspired map! Let me know in the comments below what you want to see added from the StarCraft universe. I’m always open to suggestions for what you want to hear about! Heroes Of The Storm, We Want Fenix To Rise From The Ashes!